Children exposed to the arts do better in school, have a higher self esteem, and are more creative – some stay in school specifically to have access to the arts. The arts help children develop the skills to be more collaborative, innovative and culturally aware, this helps them succeed in today’s globally connected world. Whether it is dancing, singing or acting every child benefits from just having the opportunity to participate in these activities. 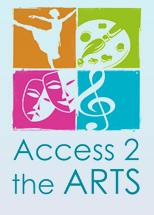 Access 2 the Arts was developed to remove barriers to children experiencing the arts. We work to create greater visibility in order to educate the public to change this situation – inspiring others to volunteer their own talents to help all kids experience the arts. This program will help students find their talents, score higher in their academics and promote a sense of self-worth essential to keeping them in school. It will also make the world a better place by increasing our creativity, innovation and happiness. The arts have allowed me to express my creativity, discover who I am, and open my heart and mind to all the possibilities the world holds. I want every child to experience this same opportunity. Imagine the possibilities, won’t you join me? My sister and I created this organization to take down the barriers that prevent kids from experiencing the arts. While a lot of our effort has focused on helping local children to sing, dance and draw we discovered that we can reach children elsewhere in the world too. This is an area where I have been able to lead our efforts. Having the opportunity to travel to different countries over the past couple of years has taught me that children everywhere deserve to experience the arts. We have a responsibility to share our blessings with other and make this world a better and brighter place. For all these reasons we are working with partners to take advantage of any opportunity to spread the arts to children in other parts of the world. We have been able to send art supplies to children in Belize and India and our future plans include doing this on an annual basis. The children who received these supplies were DELIGHTED and I share some pictures of their happy faces below. If you have a partner who is travelling to a school or orphanage overseas let us know and we can work with you to provide some art supplies to them as well. Please reach out and help us support the arts today to create a brighter tomorrow. This charity will help fill a gap that the current economy has created regarding arts education and experience for our children. Studies show that the arts help children develop the skills to be successful in school as well as to compete in the globally connected world we live in. It is in the best interest of our country to raise our children with access to the arts so they grow up to be intelligent, creative, and innovative adults. Supporting the arts today creates a brighter tomorrow.